Levetiracetam (LEV) is used in the setting of acute brain injury for seizure treatment or prophylaxis but its safety and efficacy in this setting is unknown. We retrospectively analyzed the patterns of use and safety/efficacy of LEV in 379 patients treated in the neuroscience intensive care unit (NSICU). We extracted from the charts clinical data including diagnosis, AED therapy before and during stay in the NSICU, complications of treatment, length of stay, and clinical outcomes (improvement, Glasgow Coma Scale, and death). We analyzed the data using binary and ordered (multi-category) logistic regression. Overall, our findings are that phenytoin used prior to the NSICU admission was frequently replaced with LEV monotherapy (P < 0.001). Patients treated with LEV monotherapy when compared to other AEDs had lower complication rates and shorter NSICU stays. Older patients and patients with brain tumors or strokes were preferentially treated with LEV for prevention and/or management of seizures (all P ≤ 0.014). 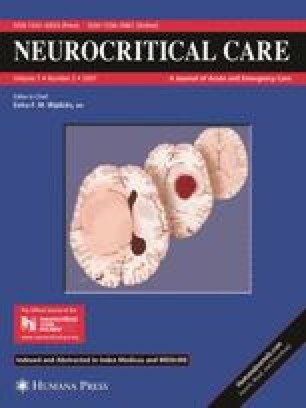 The results of this study suggest that LEV is a frequently used AED in the setting of acute brain injury and that it may be a desirable alternative to phenytoin. Prospective studies evaluating the long-term safety, efficacy and outcomes of LEV in this setting are indicated. Support for this study was provided by UCB, Inc. (UCB Young Investigator Research Project to Dr. Meckler); this work was presented in part at the American Epilepsy Society Annual Meeting in Washington, DC, 12/2005 and at the 7th European Congress of Epileptology, Helsinki, Finland, 7/2006. Drs. J.P. Szaflarski, Meckler, Shutter and Privitera received compensation for various activities sponsored by UCB Pharma. Dr. Yates is an employee of UCB, Inc.